Kill the Noise. – The Write Pieces. “Kill the noise. Kill the noise. Kill the noise.” I repeated these three words to myself over and over as I struggled to remain focused on the good in life. Distracted by my unfulfilled desires and fear, I found myself deep in question and without answers. Then I heard it, “kill the noise. kill the noise.” An image from the movie Race replayed in my head. The scene shows Jesse Owens being taunted by a group of racist football players as his coach deliberately raises his voice in order to speak over them, reminding him that they, and everything like them, were just noise. For the past year of my life, I had been aggressively desiring for my career to blossom. I was waiting on my big break. When it had hit a year since I left my job, I was filled with resentment, fear, anger, and disappointment. I felt like a failure and I couldn’t figure out what I had been doing wrong. Until one day, I decided to go read one of my old journals from 2014. Instantly, I was reminded of why I had been stuck for over a year. I was still asking the same questions that I was asking back in 2014. I was still asking them because I had yet to follow the advice God had given me the first time I asked. While moving forward with my writing, I had yet to truly put in the work and time it takes to be who I desire to be. I had been second guessing myself for almost two years instead of riding the wave of faith. 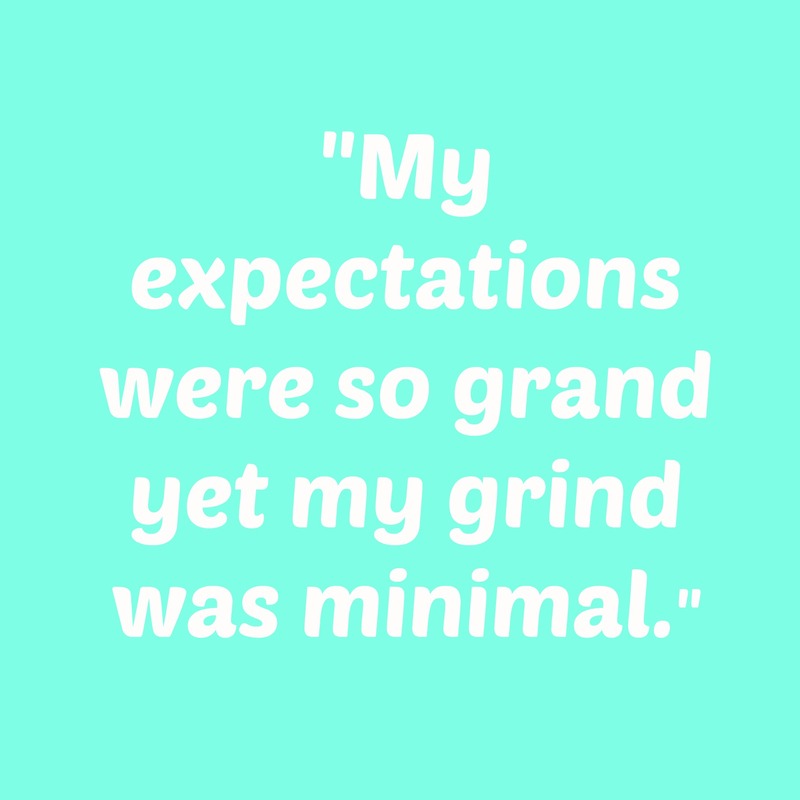 My expectations were so grand yet my grind was minimal. I listened to God say “kill the noise” for about two weeks before I actually took action to do so. I began to realize that noise was everywhere and in several different places of my life. Noise was the opinions and thoughts of others that I would so helplessly cling to in my time of need. Noise were the five TV shows I was committed to watching every week or the breaks I would take in between work that would last several hours. Noise was twitter and Facebook as I scrolled down ingesting ideas, thoughts, and stories of those I began to invest into; even if just mentally and emotionally. I recognized noise as any and everything that distracted me from myself, my spirit, my hustle, and my focus. Since writing that status, I’ve taken steps to actually do what needs to be done in order to gain results. My book has been written, I consistently write on my blog, I left my job, I’ve applied for jobs. Yet and still, my efforts to keep going are minimal. I work hard for a few months and expect results to appear.I begin to compare myself to others and even lead myself astray in efforts to find the secret formula. “Kill the noise” is a reminder that I am the secret formula. The thoughts and ideas that I second guess are my answers. The tug on my heart to continue an idea or organization that appeared to be too much for me. I was running from myself and looking for myself all at the same time. Looking for myself and for answers in the noise. So. Now as I find myself getting distracted, I repeat “kill the noise.” Expectantly, I can hear and see more clearly that I ever have before. My mind is focused and everyday I’m gaining clarity on the direction of my life with each step I take and instruction I follow. You are your own answer. Find yourself and your answers, within yourself. You aren’t as aloof as you think. You just have to believe God, believe in yourself and kill the noise. Previous post: Is Self Love Selfish? I so relate to what you’re experiencing. I always tell myself that I could be further along with less tv and facebook time and more creative time. Then, a friend shared a quote with me, that is now my constant reminder to produce: “Don’t expect level 10 success with level 3 effort.” You’re right. I am my own answer. I love you for this and this came at the RIGHT time. Thank you! This is a lovely piece I needed it to! Social media is a good and bad thing, you waste time being motivated by other people you don’t really start on your own project!